Are you a small-business owner? Or do you know a small-business owner? 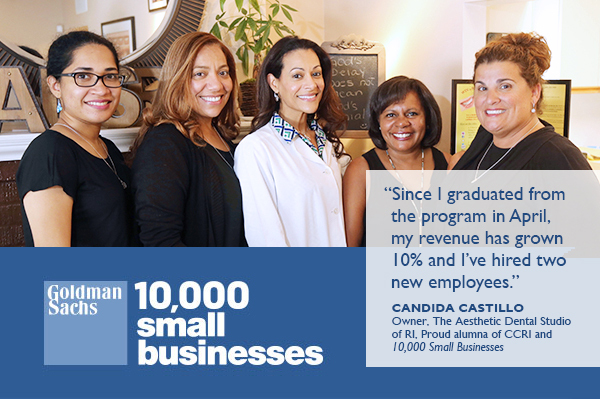 Goldman Sachs 10,000 Small Businesses is a 12-week business education program hosted at CCRI that helps Rhode Island small businesses grow and create jobs. Through the program, small-business owners gain practical skills in topics such as negotiation, marketing and employee management that can immediately be put into action. In addition, business owners receive the tools and professional support to develop a strategic and customized five-year growth plan. We look for applicants who are passionate about growing their business and creating jobs in their communities. We’ve helped over 150 Rhode Island small-business owners grow their businesses; check out our alumni list here. Apply by Monday, October 1, for our next cohort! Every applicant selected receives a full scholarship. Questions? Please contact Elizabeth Russo, outreach director, at erusso@ccri.edu or 401-871-7219.